Formax FD 450 Automatic Letter Opener - Roberts Business Machines, Inc.
Automate the tedious task of opening incoming mail with the Formax FD 450 automatic letter opener. 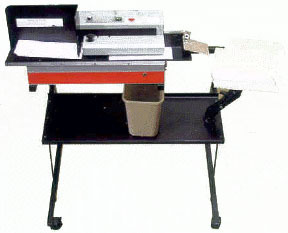 The FD 450 reliably operates at speeds of up to 300 envelopes per minute. One side of the envelope is slit so that the contents are left undamaged with no messy paper scraps to clean up. This increases work flow and ensures document integrity.